ASEAN (Association of South East Nation) turns 50 on Aug. 8, 2017. The Association of Southeast Asian Nations (ASEAN) today is a key global hub for manufacturing, retail, telecommunications, financial, transportation and trade – and one of the fastest growing consumer markets worldwide. Though all 10 economies of the ASEAN community are positioned at much different stages of development, they all share an enormous growth potential – both as individual economies and ASEAN as a whole. This has drawn many investors and multinational corporations from the West to turn their undivided attention to the East – especially to the 10 dynamic markets that forms the ASEAN family. In conjunction with the 50th anniversary of ASEAN, The ASEAN Post intends to take you five decades back in time to see how ASEAN has grown and what makes it unique compared to other economic pacts. These 10 nations are not only rich in diversity, but are also swift and competitive in their growth as individual economies. ASEAN consist of 10 different individual economies that are diversified in terms of cultural background, religious beliefs, currency denomination, political standing, trade stance and general sentiments. Looking at the journey of ASEAN in the last five decades, it is indeed a moment of pride that we are able to function as a community in spite of our differences. ASEAN is indeed inspiring because we are always full of hope in establishing peace and equal prosperity across the 10 countries. The ASEAN family stands as an example in collectively handling nations of greater diversity. ASEAN was established in 1967 with the signing of the ASEAN Declaration by the founding nations, namely Indonesia, Malaysia, Philippines, Singapore and Thailand. 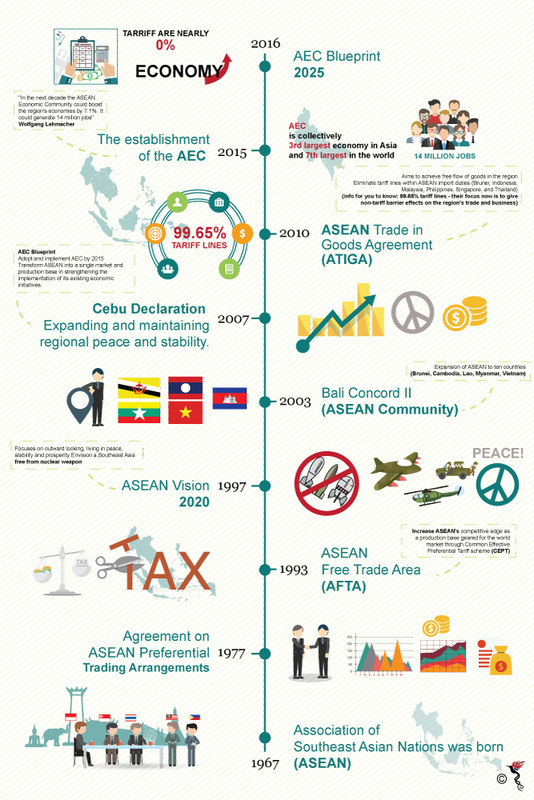 The other Southeast Asia nations ended their days of isolation and joined the ASEAN community later in various timelines along 1984-1999 (namely Brunei, Cambodia, Laos, Myanmar and Vietnam) – making up what is today the 10 member states of ASEAN. Half a century old, ASEAN has always stood as ONE – in terms of mutually shared vision, identity and community. ASEAN has religiously practiced the concept of family over the last 50 years in creating a community that is strong and united – built on the foundation of its people-to-people relations. This has lead ASEAN to be a reliable platform for geopolitical engagement within Southeast Asia – confined by the ever-evolving economic challenges that we co-exist in. ASEAN in its various annual meetings, dialogue sessions and forums – continuously strive to stimulate cooperation among the nations while discussing on various issues that impact ASEAN in terms of trade, education, health and diplomacy. ASEAN believes in dialogue and engagement, instead of marginalisation and isolation of economies. That is perfectly why ASEAN’s flexibility lies in its culture of consultation and consensus, where we ensure that all ASEAN initiatives have the full support of its members – avoiding discrimination and dissatisfaction. This is ASEAN’s primary decision-making base. Taking it a step further, ASEAN Regional Forum (ARF) functions as a political and security consultancy to build confidence and prevent diplomacy. Any disputes among the ASEAN family is settled through friendly negotiations based on the Treaty of Amity and Cooperation (TAC) 1976. Our combined GDP has grown from US$95 billion in 1970 to US$2.4 trillion in 2015 – making ASEAN the world’s seventh largest economy. The community is intensively marching forward to become the world’s second most successful regional organisation, after the European Union (EU). ASEAN has a combined population of 625 million people – making us the third largest population in the world. With such a large growing population, ASEAN is able to provide an abundant skilled labour force supply and broad regional market for trade and investment. ASEAN’s inspiring endurance of 50 years lies in the fact that the collective community respects and understands its individual member countries in their amazing diversity – including the free-wheeling democracy of Philippines, the one-party states of Indonesia, the modernity journey of Myanmar, the sophisticated financial hub of Singapore – and everything in between and beyond. The united bond that members of the community share allows for cross-border ideas and suggestions to be communicated and implemented for the betterment of ASEAN collectively. Each individual member’s views are factored into the regional decision making process. We have stood by each other during various challenging landscape, including the 1997 Asian Financial Crisis, which was almost two decades ago. ASEAN brought renewed interest to the region from major powers like the US, EU and China to nurture and further enhance relations with the Southeast Asia nations. ASEAN has grown into an attractive one, drawing foreign investments for development and infrastructure which are drawn by the top five (T5) economies (Indonesia, Malaysia, Philippines, Singapore and Thailand). They uplift ASEAN as an economic collective community. The ASEAN nation also takes pride in the various powerful leaders that the region has seen and drawn inspiration from, such as former Indonesia President Suharto, former Malaysian Prime Minister Mahathir Mohammad and former Singapore Prime Minister Lee Kuan Yew. Such leaders were bold in their actions and vocal in their thoughts – pushing not only their respective administration towards success and growth, but subsequently contributing to the well-being of ASEAN as well. The ASEAN Economic Community (AEC) 2025 aims on a shared vision of ASEAN to be more outward-looking and continue to invest in mutual peace, stability and prosperity – backed by our un-dying partnership of pushing equal development and being a caring community. This being the primary driving force for ASEAN to achieve regional architecture. Times have significantly changed in these 50 years since its establishment. ASEAN now faces modern age challenges, namely the urbanisation rise, the rising power of China, terrorist threat and technological revolution. If ASEAN continues in its same path of togetherness, it will be able to successfully combat these challenges and march forward to achieve its desired economic growth objective in the coming decades. ASEAN has come in a long way in fostering cooperation and collaboration to achieve current levels of development. The principle of prosper-thy-neighbour is the mantra of the ASEAN family and has been the basis for our achievements thus far. This is undoubtedly a teamwork effort. ASEAN really has evolved and progressed to achieve so much more than what ASEAN would have aspired to be at the beginning of its establishment. ASEAN is not team simply because we work together, but because we share mutual respect, trust, care and responsibility for each other – which we can proudly boast as the ASEAN spirit. Though we work as a community, the individual space that we allow among the 10 member countries is definitely commendable. This is unlike the Brexit vote where UK left the EU at the back of discontentment and reduced control of their country on sentiments related to matters like immigration, economics and trade. So, ASEANists, tap your shoulders in honour as we have come so far in establishing a communal family that continually supports, encourages and functions as a pillar of strength in odd circumstances. All credits due to ASEAN, the region’s never ending pride. Happy 50th anniversary ASEAN. You have made us all proud!